By Hairee Lee Welcome to drinking good beer. Gluttonously. I've never been to Harpoon's Oktoberfest before. It's a mammoth machine: there's the nearly a dozen free shuttle buses that transport Octoberfesters and Harpoon lovers from South Station directly to the brewery within minutes; there's the $20 cover, which only includes 1 beer, but people seem completely okay with paying ((I wouldn't pay $20 cover for a club or anything at my age)); there's the strategically place, speaks-for-itself, impressive walk from the entrance to the beer tents that all guests must pass through to make sure you're impressed by Harpoon and by association makes you feel good about you; there's the plastic pint glasses that won't shatter if you drop it after the 4th pint, but good looking enough to keep if you're sober enough to hold on to it by the end of the day; there are food stands of every pub favorite you can think of to go with your Harpoon pints; there are boxes and boxes full of Harpoon gear with sweatshirts priced at $50 per piece which won't look so expensive when you're 5 beers in and the temperature drops from afternoon to evening; there are the lederhosen clad bands, and they're playing under tents in case it rains; and last but certainly not least, there are the God-awful long lines of good looking, well dressed 20 to 40 year olds all looking to drink their fannies' off and start partying on a Saturday afternoon. Like I said, it's a machine. And it's impressive. 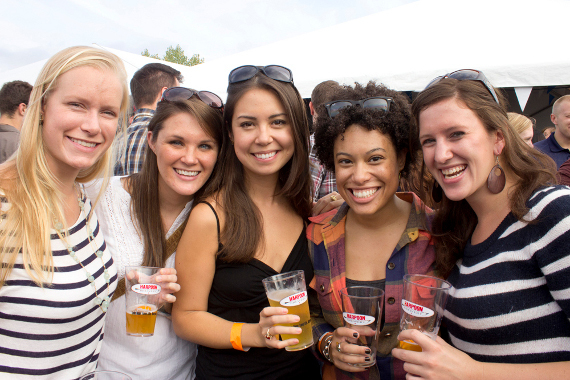 In the mean time, enjoy Harpoon's Octoberfest and Harpoon Octoberfesters.